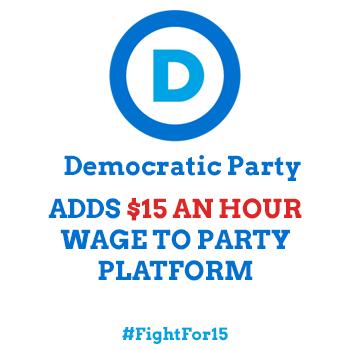 In yet another monumental win for the Fight for $15, the Democratic party announced that they’ve added support for $15 an hour pay to their official party platform. One of the most important institutions in American politics has thrown its weight behind a $15 national minimum wage. We just keep winning. The fight is far from over, but statewide victories in New York and California, along with citywide victories across the country in places like Seattle and Pittsburgh, have kept the fight growing, and we won’t stop until we win $15 an hour and union rights EVERYWHERE.